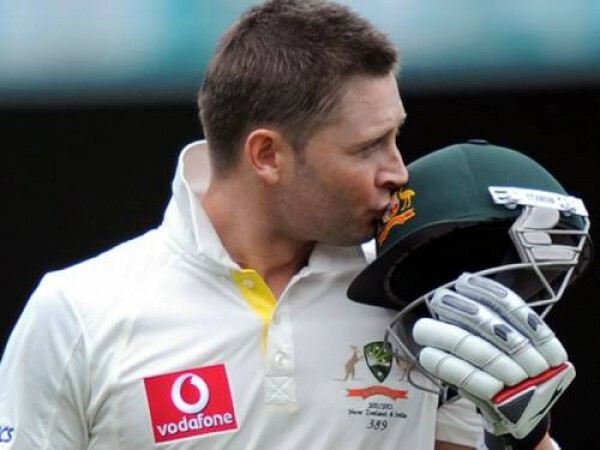 Michael Clarke continued haunting South Africa with an unbeaten double hundred assisted with a ton from David Warner and Michael Hussey as Australia rules again. Australia hammered 482 runs for the loss of just five wickets at a superb run rate of 5.55 on the opening day of the 2nd Test which commenced on Thursday, November 22, 2012, at Adelaide Oval. Earlier, Michael Clarke won the toss for Australia, felt no hesitation in batting first and sent in David Warner and Ed Cowan to open the innings. Warner hit the first four of the day in the fourth over followed by two back to back fours in the sixth over. His steamy innings continued when he added another 4 fours in the 8th and 9th over but Cowan was caught and bowled by Jacques Kallis for 10 as the score reached 43 runs. Rob Quiney became the next victim one run later without opening his account as the poor form of Rick Ponting brought him to another debacle when he was clean bowled by Kallis for four mere runs. 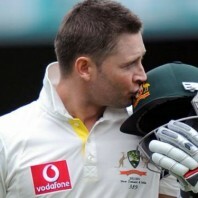 The Kangaroos lost their third wicket at 55 in 13 overs when their determined captain, Michael Clarke, appeared on the scene. Warner completed his fifty in the 15th over as Clarke started off with a four on the sixth ball he faced. The home side reached 102 in 25 overs at lunch without losing any further wicket. The batsmen changed their gears right after the interval as they dispatched 46 runs in five overs comprising 2 sixes and 7 fours. David Warner smashed his third Test century in the 31st over with 1 six and 1 four while Clarke attained his fifty two overs later with a couple of fours. The duo hit 16 runs in the 34th over with 3 fours and the second hundred of the innings was displayed on board in the next over. The entertaining fourth wicket partnership of 155 runs concluded when David Warner was caught by Graeme Smith off Morkel for 119 from just 112 balls with 4 mighty sixes and 16 fours. The most experienced batsman of Australia, Michael Hussey, joined in next with Clarke who was having a great time in the centre. The pace of scoring kept on rising and the boundaries were flowing from the bats of the two stroke players. Michael Clarke thrashed his 21st Test ton on the last ball of the 49th over with a four as the home side piled up 178 runs in just 26 overs between lunch and tea interval and touched 4-280. There was no mercy for the rival bowlers from the two batsmen at the crease even after the tea interval and especially Clarke was the most devastating of the two. Hussy got his fifty off 62 deliveries on the third ball of the 61st over with a four as Clarke punched his 150 four overs later by punishing Morne Morkel for 5 fours. Michael Hussey was given caught behind by the field umpire, Billy Bowden, on the fourth ball of the 67th over at 64 runs. The batsman was unsatisfied with the decision and asked for the review and the third umpire gave a positive response to Hussey. The score board was running and the fourth hundred was registered in the 75 overs as Michael Clarke plundered his consecutive double hundred on the second ball of the 82nd over. He became the first batsman to score four 200 plus runs in a calendar year and surpassed the two Australians, Don Bradman and Ricky Ponting who have registered three double tons each. 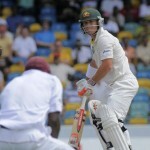 Michael Hussey powered his 18th Test hundred with a grand six over deep midwicket on the next ball of the same over. 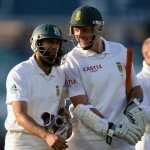 The mammoth fifth wicket association of 272 runs off 297 deliveries came to an end at 482. Michael Hussey was clean bowled by Dale Steyn on the fifth ball of the 87th over for 103 off 137 with 4 huge sixes and 9 fours. Michael Clarke was unbeaten for 224 from just 243 balls with 1 six and 39 fours as Australia amassed 482 runs with five wickets in hand at stumps on the first day. 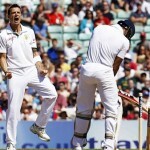 Morne Morkel and Jacques Kallis were the top wicket takers with two each whereas Dale Steyn Held one. Australia is in a commanding position on the very first day of the second Test and South Africa has to work hard for saving the match.